An Alaska Native corporation will soon provide support services for the U.S. Navy in Guantanamo Bay, on the island of Cuba. Tlingit Haida Tribal Business Corp. won the $18 million contract earlier this month. It’s another step in the growth of the profit-making arm of the state’s largest tribal government. Tlingit Haida Tribal Business Corp. is owned by the Juneau-based Central Council of Tlingit and Haida Indian Tribes of Alaska. The council lists more than 30,000 tribal members in Southeast, the rest of Alaska and around the nation and the world. Its business operations are separate from those of Native corporations formed under the Alaska Native Claims Settlement Act. Business corporation subsidiary KIRA announced the Guantanamo contract April 12. It will manage maintenance services, port operations and waterfront administration for the base. The corporation announced a similar, $44 million contract about a week earlier for the U.S. Marine Corps air station in Beaufort, South Carolina. The contracts are among more than a dozen providing military and other government support services from Florida to Alaska. CEO Richard Rinehart said the corporation continues to seek more work. “I look at it as it’s like longlining. We have all these lines out with lots of hooks. And we’re out there fishing and by having more lines in the water, we’re hopeful to bring more home,” Rinehart said. Rinehart and others discussed the business corporation’s progress at the central council’s recent tribal assembly in Juneau. He said sales were $57.7 million in 2017, close to twice the amount of the previous year. Rinehart projects about 30 percent more sales for the current year. Net income last year was only $865,000. But it was a third more than the previous year. Rinehart said the amount will increase as startup costs are paid off. General Manager Bob Hamilton said military and other contracts are due, in part, to the corporation’s 8(a) status. That’s a provision in federal law that gives minority-owned and disadvantaged businesses a bidding preference. Hamilton said the corporation began with janitorial contracts. “And now we’re in IT, security, aircraft logistics as far as support and services for aircraft and we’re actually in port management. So we’ve really come a long ways,” Hamilton said. Tlingit Haida Tribal Business Corp. officials say it employs about 600 people. Most of the jobs are in other parts of the country. But the corporation’s hiring policy includes a preference for tribal members. 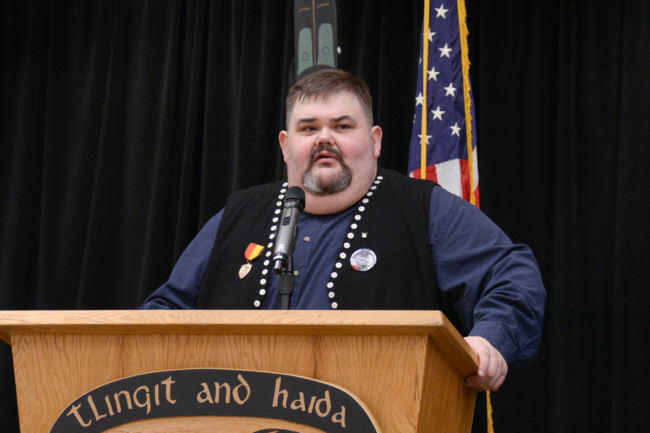 Tlingit Haida Central Council President Richard Peterson made business development part of his platform when he ran for office four years ago. He told this year’s tribal assembly it’s still a top priority. “We’re only as sovereign as we can afford to be. We need economic sovereignty. We need to be able to manage ourselves sustainably, not so dependent on the federal government, so that we can exercise true self-determination and do what we see fit for our tribal citizens,” Peterson said. Peterson was re-elected president at the tribal assembly, which was held April 18-20.